Large Livestock – cattle, sheep, goats, pigs, bucks, etc. Photizo Vetcare relieves pain, stimulates cells to repair and heal, reduces swelling and inflammation, and promotes immune system function in acute traumatic conditions. Photizo Vetcare is effective in treating chronic pain and inflammatory conditions associated with arthritic conditions and overuse injuries. It stimulates healing, relieves pain, swelling and inflammation, reduces muscle spasms, and increases the blood and lymph vessel diameter, to ensure clearing of waste products and inflow of oxygen, nutrients and medication concentrations in the areas treated. Skin conditions: wounds, lacerations, hyaloma tick bite necrosis, hot-spots, abscesses, saddle sores, habronema, proud flesh, acral lick granulomas, bruising, otitis externa, pyoderma, pododermatitis, skin allergies, eczema, etc. Musculoskeletal problems: Arthritis, tendonitis, myositis, ligament/tendon sprain/strains, bruising, fractures, neck and back pain, splints, overuse injuries, synovitis, edema, hematomas, muscle injuries, muscle spasms, trigger points, seromas, mastitis, etc. Photizo Vetcare stimulates the energy production (ATP) inside the cell, by up to 250 times, thereby stimulating the cells to function at optimum levels. It further stimulates and regulates DNA and RNA synthesis – the programs inside the cell – to follow the correct healing process, and reduces scar tissue/proud flesh formation. 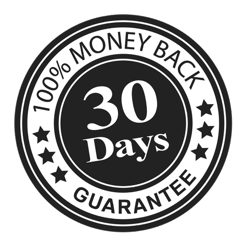 This speeds the natural healing process by up to 30-40%, and reduces the likelihood of excess scar tissue formation and complications. Photizo Vetcare stimulates endorphin and serotonin secretion. This is the body’s own pain and relaxing “medication”. Photizo Vetcare effectively reduces the inflammatory process that is caused by damage, injury or overuse and reduces muscle spasms and trigger points. Photizo Vetcare assists in reducing swelling by increasing the blood vessel and lymph diameter to clear excess waste products from the injured or inflamed area. This reduces the pressure and irritation on nerve endings that causes more pain, and increases blood flow into the area, ensuring that the tissues can absorb more nutrients and oxygen.This also helps to reduce excess wound substrate to reduce the risk of secondary bacterial infections. The increased blood supply to the area ensures higher concentrations of topical and systemic medications delivered to the affected area. Photizo Vetcare stimulates the immune cells, to react against infections. Photizo Vetcare stimulates optimum cell condition (skin, bone, nerve, capsule, cartilage and muscle tissue) to maintain healthy tissue. This may help to prevent degeneration of tissues like nerves, bone/joints and blood vessels. The healing phases are as follows: inflammation, proliferation and organization phases. Chronic “injuries” or overuse inflammatory reactions occur when the tissue does not complete this cycle; the tissue stays in the inflammatory phase and does not progress into the proliferation (actual healing of cells and tissues) or organization phase. For these “injuries” to heal, the body needs stimulation of the cell’s programs (DNA and RNA), e.g. finalize the inflammation phase and move onto the real healing phase. When the inflammation process organizes into scar tissue formation, it causes adhesions that inhibit the normal “gliding” of muscle and tissue fibers, causing irritation, and further inflammation, turning into a vicious cycle. Photizo Vetcare helps relieve muscle spasms, release painful trigger points, reduce the inflammatory processes and relieve pain, thereby breaking the cycle, to give the tissue the opportunity to start the healing process if possible, or in chronic conditions, maintain pain free periods. 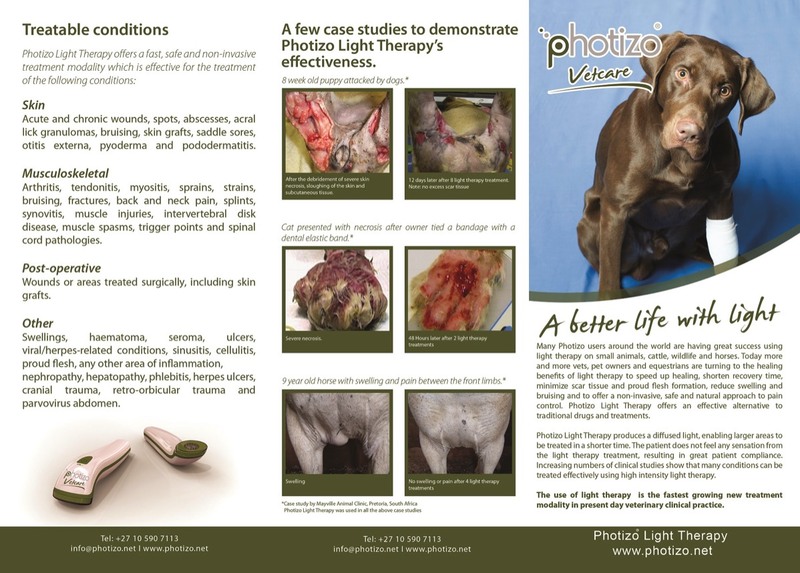 Please note that treatment with the Photizo Vetcare will not break down the adhesions, but will control the inflammatory processes and discomfort, and reduce the risk of further scar tissue formation. Always treat immediately when the problem starts, as this will help prevent chronic problems. The Photizo Vetcare stimulates endorphin and serotonin secretion. This is the body’s own pain and relaxing “medication”. (This effect is especially profound in the feline family). 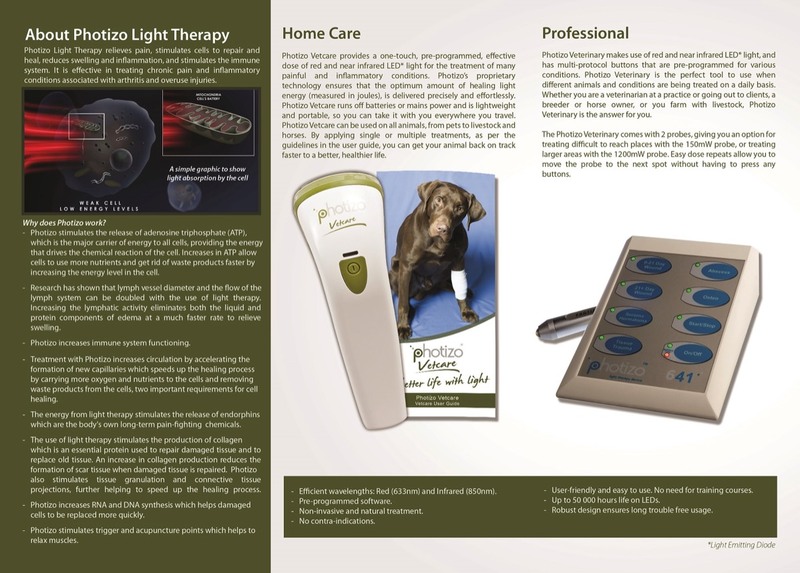 Photizo will effectively reduce the inflammatory process that is caused by damage or overuse. Photizo effectively reduce muscle spasms and releases tight trigger points.